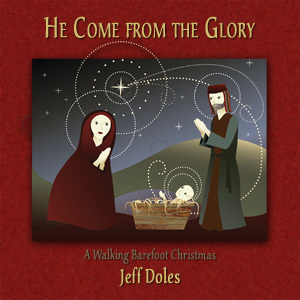 Fresh folk and acoustic arrangements of traditional Christmas carols, including some lesser-known gems. Fun and diverse. All about King Jesus coming into the world. You can download a FREE booklet (PDF) with lyrics and CD info. Also for your Christmas celebration, Let Earth Receive Her King: Advent, Christmas and the Kingdom of God. This is my arrangement of the traditional West Indies carol, “The Virgin Mary Had a Baby Boy,” with a nice calypso feel (of course), a new musical bridge and additional lyrics. Jesus came down from the glorious kingdom of heaven to establish that kingdom on earth. Traditional English carol. We thought it deserved a hearty arrangement. A traditional carol of old Burgundy that portrays the simple sounds and joyful festivity of the shepherds bringing good news to the village. The ambience of a folk carnival sets the tone here. This traditional English carol has a bittersweet quality to it, comparing the attributes of the holly tree with the offering of Jesus Christ. In this arrangement, I’ve given it a more reflective treatment. An old German carol that very simply portrays how the Lord Jesus brings new life. Kyrie eleison, the refrain in the middle of each verse, means, “Lord, have mercy.” Simple arrangement, just vocal and guitar. This tender English carol is a poem by Christina Rossetti set to a tune by Gustav Holst. The coming of King Jesus ennobles the world and calls for the greatest gift we can offer. This traditional American carol lends itself well as a gentle country waltz. The third verse changes up into a musical bridge that returns at the end to the traditional refrain. It is the song of angels and the rejoicing of nations. This is an old African-American spiritual — with a little Texas swing. It is a call to follow God’s sign and behold the King. This English carol by Reginald Heber is about the star that guided the wise men to the Redeemer. Though their treasures were very costly, the greater gift we bring is adoration and the prayer of the heart. I did not much care for the traditional tune, so I composed my own. 12 ~ What Child is This? An English carol by William Chatterton Dix set to a traditional English tune, “Greensleeves.” The King of kings has come, bringing salvation. Let loving hearts now enthrone Him. An old robust French carol about the song of the angels, who declared the glory of God and announced the birth of King Jesus. A well-known African-American spiritual with a countrified treatment. Having received the good news that the Savior of the world has come, what else is there to do but to go and tell it abroad? This familiar carol was written by Isaac Watts and set to a tune by Lowell Mason. Though it is traditionally used at Christmas, it is appropriate all year round because Jesus the Messiah King has now come to rule and reign forever ~ and that changes everything.